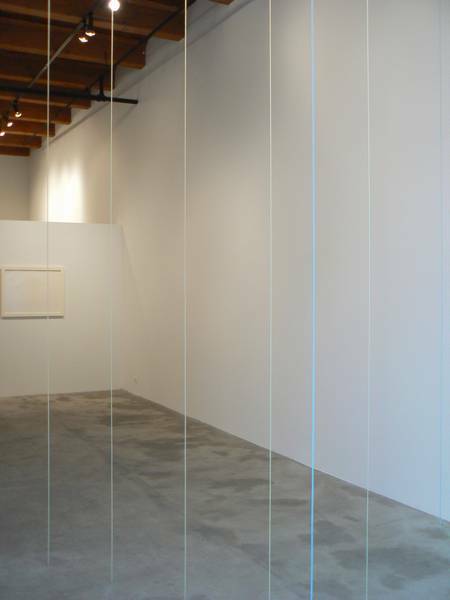 Like any good (or great) Minimalist work of art, Fred Sandback’s sculptures emit an air of ease; they’re easy on the eyes, quite possibly easily made, and once you “get it,” easily enjoyed. Although in order to successfully exist, these sculptures ask kindly if they can have some of your space. If you allow, they will become breathing things that solidify airspace and pull your perception. If you deny, they are merely yarn strung between several points on the walls, ceiling, and floor. To turn them on, so to speak, one must tune in. Born in New York in 1943, Sandback studied at Yale and emerged in the late Sixties amid art’s period of critical reevaluation. He has since become widely recognized and exhibited in Europe and the US. The Dia Foundation erected a museum dedicated to his art in Massachusetts in 1981, closed it in 1996, and currently keeps several works on permanent display in their Beacon, NY location. The Dia Beacon is an excellent environment to experience Sandback’s art because it is afforded a pristine spatial clarity. Sandback was 59 years old when he died in 2003. There is nothing precious or magical about the yarn that Sandback used. He admittedly purchased it at Wal-Mart. The physical work, the yarn strung taught, is straightforward, but it turns out that Sandback was “drawing in space.” He is now commonly granted the title of innovator of a technique that produces three-dimensional volumetric objects out of thin air. Like a doorway, Sandback’s objects are defined by their openness, where to enter one area is also to exit another. As such, Sandback’s sculptures put you in their space quite literally. Or rather, this is the illusion, for there is no “object” to speak of except the heightened awareness of one’s own bodily perception. Sandback’s game is a conceptual Möbius strip that has been fascinating the art world for decades. If you choose not to partake in theoretical mind trips, Sandback’s art is still rewarding. Most of the sculptures’ strength is drawn from their quietude and their composure, and that is in itself refreshing.